Last years top new products focused on low-sodium, probiotics and fiber to manage health problems, according to the annual IRI list. An astonishing 95 percent of new products never catch on. Those innovative few that immediately connect with consumers by solving their problems and delivering multiple benefits create the kind of buzz and purchase loyalty that can make a CFO smile. Chicago-based Information Resources Inc. (IRI) has tracked consumer packaged goods (CPG) introductions for 13 years via its New Product Pacesetters report, ranking each year’s most successful new brands. Pacesetters are those products launched between February of one year and January of the next that reach two milestones: 30 percent national distribution and retail sales of at least $7.5 million, according to IRI’s definition. When that is accomplished, IRI tracks them over the next 12 months to determine the most successful new products in their first year of “national” sales in food, drug and mass merchandising channels, excluding Wal-Mart. It is intriguing that year-one sales for new products are declining. Less than one-quarter of new brands exceed sales of $7.5 million. Over the past decade, the proportion of brands earning $20 million or more has shrunk from 13 percent to 7 percent. On last year’s list, there were six new products with sales of more than $100 million; two had sales exceeding $200 million. This year there is only one $100 million product (Campbell’s Reduced Sodium Soup). According to IRI, part of this decline is due to a rise in the introduction of targeted solutions intended for a narrow audience, but there remains a dire need to improve the new product introduction process. Virtually all of the 2007 Pacesetters are extensions of existing brands, rather than net-new brands. Historically, net-new Pacesetter brands have earned higher year-one sales than extensions. However, in food and beverages (IRI also tracks health & beauty aids and household cleaners), extensions were equally successful as new. Apparently, manufacturers are cracking the code on getting a larger return when leveraging existing brand equities by creating excitement and distinguishing the new items on the shelf. This year, net-new brands Frito-Lay’s Flat Earth fruit and vegetable chips, Stride gum and Vault beverages are experiencing great success. 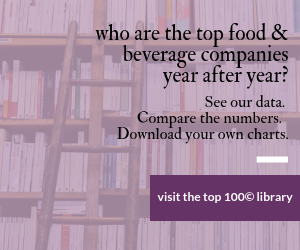 There were 916 new food and beverage product introductions across food, drug, and mass channels (excluding Wal-Mart) in 2007, compared with 908 in 2006. While taste, variety, and convenience continue to be important to consumers, health and wellness is the current rage. Food and beverage winners in 2007 offer high-demand nutrition, weight management and disease management solutions. Their success points to a fundamental shift in consumers’ perceptions of food — not only a source of enjoyment and satisfaction, but a health solution with the potential to deliver very specific benefits, such as low sodium to manage high blood pressure, probiotics to boost immunity and whole grains for a healthy heart. As aging baby boomers find their blood pressure rising, it’s not surprising that salt reduction led the way in 2007. And lowering salt is perceived by consumers to be good for the entire family. The winner was Campbell’s Reduced Sodium Soup, which consists of 85 SKUs, and was the top selling brand with sales of $101 million in the first year. Birds Eye Steamfresh offers a quick and convenient way to cook frozen veggies while retaining taste, texture and nutrients and using a packaging technology that will change other frozen foods. Fiber One snack bars deliver 35 percent of the recommended daily fiber intake and they are ideal for on-the-go consumers. And Sara Lee Hearty & Delicious breads deliver both fiber and whole grains. DanActive yogurt drinks give immunity a boost, and Dannon Activia Light aids digestion. Extending day parts, Gatorade A.M. (with sales of $70 million) sports drinks were introduced for morning routines and to replenish fluids lost during sleep. Vault soft drinks provide a boost for energy-impaired, overworked consumers. Indulgence without calories was very appealing to consumers, as evidenced by the strong performance of Heineken Premium Light beer and Diet Pepsi Jazz, which comes in unique flavors such as Caramel Cream. In fact, reduced calorie benefits in general were far more prevalent this year. Portion control is in high demand, as evidenced by Frito-Lay Mini Bites, Hershey’s 100 calorie candy and Quaker Chewy 90 calorie granola bars. Snack bars and cereal remain the most productive food and beverage categories in Pacesetter intros, but categories including salty snacks, beer, ready-to-drink coffee and tea and bottled water stepped up offerings. Consumers expect convenience in new products, but it is notable that this benefit must be paired with other high-demand benefits, such as health and wellness. The proof in the pudding is that the percentage of food and beverage products offering extra convenience, added portability and ready-to-use attributes dropped slightly to 23 percent compared to 24 percent in the 1997-2007 timeframe. Already, IRI is tracking next year’s Pacesetters. The likely candidates are a mix of healthier and more indulgent products, sharing a common theme of offering multiple benefits. Healthy Choice Café Steamers deliver the convenience of microwave steaming with tasty low-calorie restaurant-inspired recipes. Progresso Light soup offers weight management benefits at only 60 calories per serving but also high fiber and a full serving of vegetables. On the beverage front, multiple benefits is key. Miller Chill is a light beer with the unique flavors of lime and salt. Diet Pepsi Max offers ginseng in addition to caffeine, and Coke Zero Cherry offers a sweet, indulgent taste. And while health and wellness attributes continue to be vitally important, we are also seeing more indulgent products with added benefits. Hormel Complete meals are shelf-stable and ready to eat in 90-seconds. DiGiorno Ultimate frozen pizza contains premium ingredients. Oreo Cakesters and Hostess 100-Calorie packs offer portion control. Dreyer’s/Edy’s Loaded ice cream is loaded with indulgent mix-ins, such as cookie dough and brownies, creating an ice cream shop experience. It is, indeed, important to note that while consumers are trying to eat healthier, change has been slow. IRI’s 2008 Snacking Study found consumers still allocate two-thirds of their snack spending to indulgent products — evidence there is still room for innovation in indulgent products as well as in healthier ones. The appearance of several functional food and beverages on this year’s Pacesetters list points to a very powerful underlying trend that will gain significant momentum in the coming year: consumers are increasingly viewing food and beverages as health solutions. Products delivering disease management and prevention benefits will be far more prevalent over the next few years, and increased availability will further fuel changes in consumer attitudes and approach to diet. Antioxidants, immunity-boosting ingredients, cholesterol-lowering ingredients and digestive aids will be in high demand. Consumers are increasingly seeking exceptional experiences—both sensory and premium. Demand is on fire for new tastes and flavors, fueled by demographic shifts, including population aging (as we lose our sense of taste when we age) and growth in ethnic markets. In addition, despite an unfavorable economy, consumers are gravitating toward premium products across select product categories, including chocolate, coffee and beer. This quest for unique, satisfying experiences likely will not wane if we officially head into recession, as small indulgences become even more important when times get tough. With one-fifth of consumers “sustainability-driven” in their brand choice, there is a major opportunity to differentiate food and beverage brands through packaging that is reduced, biodegradable or made from recycled materials. Yet, few food and beverage manufacturers have made significant packaging changes to date. Fewer still have communicated sustainability improvements in packaging or other areas directly to consumers—opening up a whole new source of competitive advantage for early market leaders in this space. The enormous success of Birds Eye Steamfresh, which leverages steam-cooking technology, will pave the way for a major focus on new cooking methodologies that deliver added convenience, as well as other technologies to preserve food freshness and flavor.